Certain types of smaller projects will be exempt from Planning. This is assessed and cleared in advance with Planning Authority if not clear cut. The planning stage of a project involves the creation of specific dimensioned drawings to scale and documentation set out by the Planning Authorities. it will include choices of external materials and solar powered heating and any visible or screened heating / cooling seen from the outside of a building. In certain cases it will include input from the other professionals – Structural and Services Engineers and others. In all cases it is advised to present the proposed Development to the Planners for the Area in a Pre-Planning Meeting to get valuable feedback on how they will view it, areas of concern to address in Planning Application etc. To engage other professionals as required by Planning Authority to carry out investigations ( drainage, wells, ) or a team in the case of larger projects to submit reports with the Application. An Engineer will design the drainage for the project. To provide the necessary Planning paperwork and ownership maps / folio etc. Pay for the newspaper Notice and Planning Fee. Site Plan – showing proposed and existing context , ownership. Exemptions – if applicable for specific works. . The scale of drawings and level of design development at Planning Application permits some design input from the other design professionals at this point. 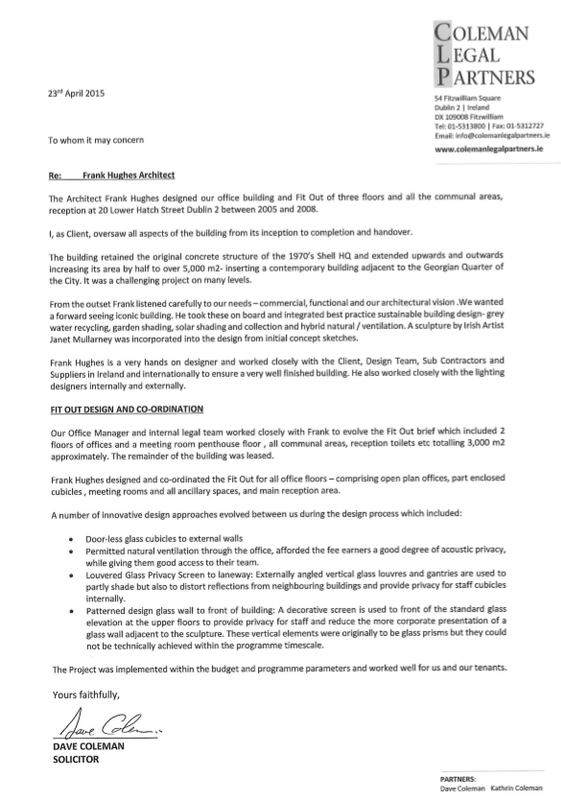 PLANNING COMPLIANCE SUBMISSION – Issued to Planning Authority . Once again Pre consultation with Local Authority is necessary to address any concerns within the Planning Application.